Holly Herrick created this elegant dish using our Spicy Recipe Slatherin’ Sauce. Holly is a noted chef, cookbook author and food writer. This makes an elegant, individually plated entrée, but can also be served platter style. A cherry pitter makes fast work of the pitting process, or simply half the cherries with a paring knife and pluck out the pits. 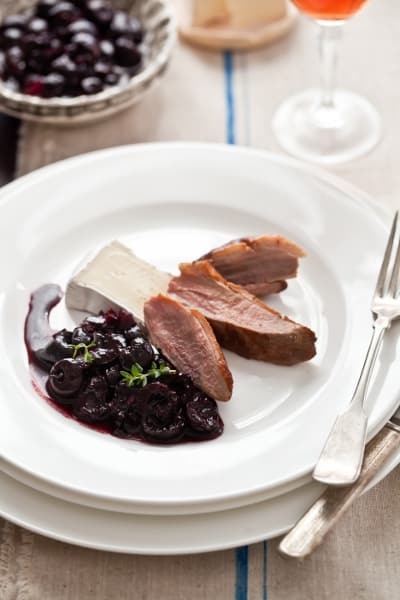 The compote can be made a day ahead, refrigerated, and re-heated while the duck cooks. Simple and delicious! Begin with the compote. In a medium sauce pan, heat the olive oil over medium heat. When warm, add the onion and garlic and season generously with salt and pepper. Cook, stirring, until just softened, about 5 minutes. Increase heat to high, and add the red wine. Reduce by half. Add the fresh thyme, cherries, beef stock, and Slather Brand Slatherin’ Sauce Spicy Recipe. Stir to combine. Season lightly with salt and fresh ground pepper. Bring up to a boil and reduce to a simmer, over medium-low heat. Cook un-covered for 20 – 25 minutes or until the sauce has reduced by at least half and the cherries are chunky and tender. Set aside for a moment. Meanwhile, prepare the duck. Remove from packaging and pat dry. Score the skin side by cutting through the skin (but not all the way through) in an “X” pattern. Season, skin side up, liberally with salt and freshly ground pepper. Heat a large, heavy-bottomed skillet over high heat. When very hot, add the duck, in a single layer, skin side down. (Do not crowd, do in batches if necessary). Reduce the heat to medium high. Cook the duck for about three minutes without moving. You’re looking to get a nice crispy/crunch on the skin and pretty golden color. Gently pour out any excess rendered fat. Reduce heat to medium and turn the duck. Season the second side with salt and freshly ground pepper. Cook another 4 to 5 minutes, for medium rare (155 degrees F, internal temperature). This can be tested with a thermometer or just touch the duck, it should be firm but yielding to the touch. Remove the duck from the pan and arrange on a plate. Cover with aluminum foil and rest for 10 minutes. Meanwhile, return to the compote. Re-heat it and reduce further if needed. Ideally, there should be about ¼ cup of pure liquid in the pan, the rest should be fruit solids. Taste and adjust seasoning if needed. When the duck is rested, cut each breast into three pieces, at an angle. To plate, place a slice (or dollop) of cheese in the center of a plate. Top with a fan of three pieces of breast and dress with the warm compote. Garnish each with several sprigs of fresh thyme if desired. Serve immediately.